It is cold out, possibly below freezing, and the dryness of the winter air, along with the additional dryness caused by forced air heating turned up high, can be a health risk, as well as plain old irritating. Dry skin, congestion, and the increased likelihood of catching a cold or the flu are just some of the ways that dry air can negatively affect you. Humidity describes the amount of water vapor in the air and this is where a humidifier comes in. Humidifiers increase humidity by releasing water vapor into a room through a slow filtering device and a fan. The ideal humidity level is between 25 and 50 percent and many humidifiers have devices called humidistats to monitor this level. Winter cold can lead to dry skin, which is itchy, sensitive, and uncomfortable. Using a humidifier will prevent high levels of dryness and soothe the itchiness, as well as preventing bloody noses and chapped lips. When the air becomes dry, nasal congestion may occur. The size of your nasal opening decreases from the mucous membranes inside of your nose swelling. A dry nose can lead to discomfort, difficulty breathing, and an increased risk of nosebleeds. People with asthma also benefit from the increased humidity and a humidifier will help ease their breathing. The dryness of the nose and skin, along with dryness of the mouth, throat, and eyes can lead to a greater chance of catching a winter cold or the flu. The flu influenza virus survives for longer in dry conditions. When there is an optimal level of humidity in a room, droplets of infected saliva from a sneeze or a cough, have a harder time of spreading from person to person. The increased humidity from a humidifier does wonders in preventing the cold and the flu. Make sure not to go overboard though. Too much humidity can be a bad thing, so make sure to buy a humidifier with a humidistat and monitor it carefully. Too much humidity will promote the growth of mold and other bacteria and put you at a greater risk for colds, the flu, and other sicknesses. 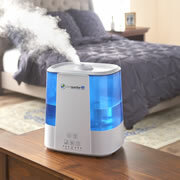 A better night’s sleep, free of itchiness and the snivels, is possibly the greatest benefit of using a humidifier. The extra sleep will leave you feeling more rested and ready to tackle the challenges that the day holds. Your body will appreciate the rest too, when it is fending off attacks from viruses outside of your home. Buying and using a humidifier this winter will work wonders.